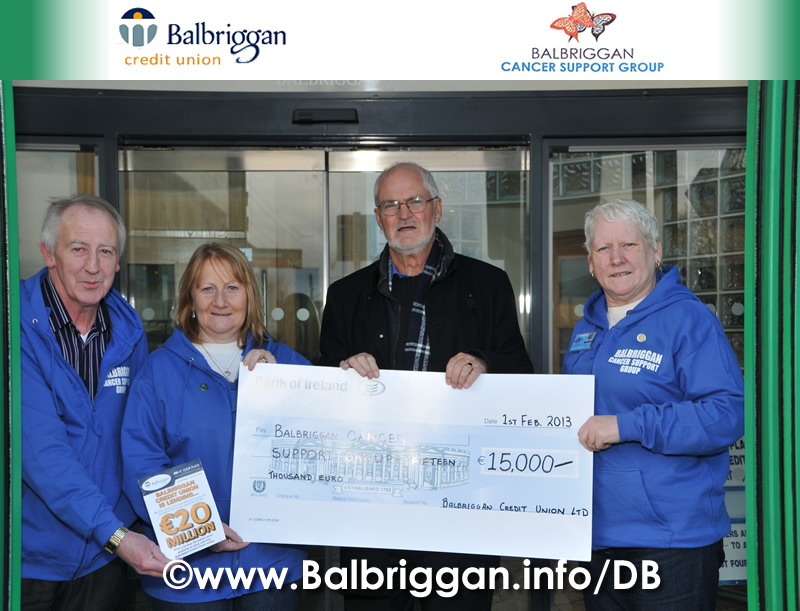 albriggan Credit Union has today announced that it is to donate €15,000 to the Balbriggan Cancer Support Group. The Board of Balbriggan Credit Union has allocated the grant of €15,000 from its Community & Social Responsibility Fund. The Fund is part of a new initiative that Balbriggan Credit Union and its 15,000 members gave the go ahead to at the 2012 AGM. The aim of the Fund is to assist local community projects and causes. The finances that the fund will provide will help furnish the Cancer Support Group’s new treatment room at their premises in Stephenstown, Balbriggan. At the AGM in December 2012, Balbriggan Credit Union and 15,000 members gave the go ahead by vote for the establishment of the new Community & Social Responsibility Fund. Balbriggan Cancer Support Groups provide a vital service in the community. The Centre itself provides a range of services to cancer patients and their families. The group is affiliated to the Irish Cancer Society and is one of only forty two such groups in the country. The move highlights the role that credit unions and their members can play in supporting their local communities. In a time of national economic downturn, Balbriggan Credit Union is particularly glad to be in a position to offer assistance to vital community services which in some instances, serve the most vulnerable in our society.